Any description of biodiversity that does not explicitly include species abundances is likely to miss important relationships on how species interact with the environment, assemble into communities, or evolve in time . However, biodiversity is not a fixed quantity, when sample size increases the number of species increases and the species relative abundances change. But, if the scaling patterns on the number of species as a function of sample size have been studied thoroughly , those of species abundances have not. The number of species and their abundances are important descriptions of a community, but to fully understand an ecosystem one needs to know how species impact its functioning, i.e., the functional diversity, and this is also a function of sample size. This project aims at answering the following question: How do the relative abundance of species and the functional diversity change as a function of sample size? The novelty of our approach lies on the premise that we should focus on the description of how diversity changes as a function of sample size and not on its characterization at one single scale. We use the species abundance distribution (SAD) to describe species relative abundance in a community. 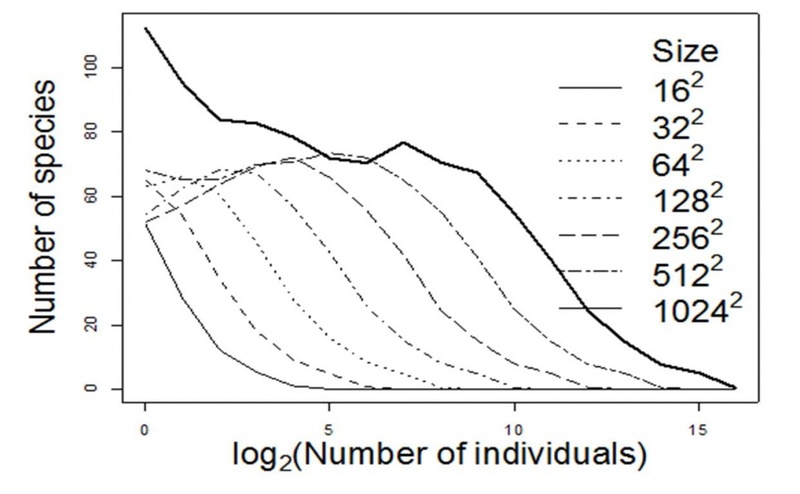 A SAD contains information on the number of species, the number of individuals (or other measure abundance) and how these are distributed among species. However, because we are interested in the description of the SADs at several scales, we need to develop methods to describe how the distributions change as function of sample size. Here, we use the moments of the distributions (hence the acronym MOMENTOS); the first moment is the average and the second relates to the variance. Although the research proposed in this project is original, it builds on theoretical and empirical research already published , thus its methods have already been tested and stand on firm ground. It is clear from our previous work, however, that much remains to be done, and it is the objective of this project to fill in those gaps. 1 - Which patterns do the SAD moments exhibit as a function of sample size and how can they be used to reconstruct SAD at large scales? 2 - What is the role of dispersal ability in the scaling properties of the SADs? 3 - What is the relationship between the scaling of functional diversity metrics with sample size and that of SADs? Science and Technology Foundation (FCT-PTDC/BIA-BIC/5558/2014). Other participants from Azorean Biod. Group: Paulo A.V. Borges; Rosalina Gabriel; Pedro Cardoso (Finnish Museum of Natural History, Univ. Helsinki, Helsinki, Finland). Other participants from other Institutions: Henrique Pereira (Biodiversity Conservation, iDiv, Leipzig); Feancisco Dionisio (CE3c).